Turns out, you can totally turn into your opponent and drag them along the wall to take a win. Who cares about racing fair, or even racing? NASCAR won’t penalize you for it. Or for tackling a dude, even though they probably had it coming. In case you missed it, Nemechek turned into the side of Custer’s truck on the pit straight at Mosport as both trucks were approaching the finish line, pinning Custer’s truck behind his own to take the win. 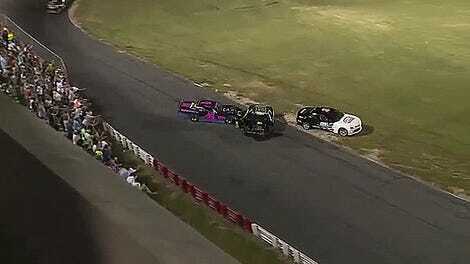 We’ve said that NASCAR is a contact sport, and drivers are racing for position. We expect that there could be contact. In this case, you know, we’d say that that was a very aggressive move but made the determination at the race track to declare John Hunter the race winner. It’s ludicrous to write what Nemechek did off as merely “aggressive.” Crashes are how racers get hurt, much less those who are working trackside who aren’t protected by a roll cage—for example, that herd of photographers standing near the finish line. Road courses like Mosport lack many of the soft walls and high fences as the big ovals that dominate NASCAR’s schedule, too, making it even more reckless to voluntarily slam into your opponent. 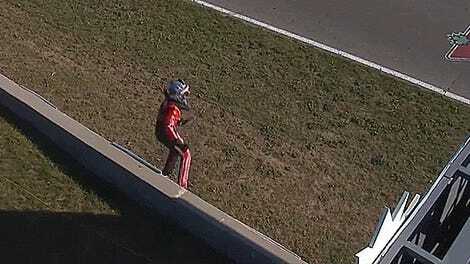 That was no mere bump and run, which many NASCAR fans are fine with. That was a slam and drag. Nemechek showed a gross lack of concern for not only the other racers on track, but the staff working the course itself. In almost any other series—especially the ones who do run more often on road courses—that would mean a stiff penalty of some sort, if not some involuntary vacation time. So, take note, truck series racers: if you want to steal a race win, just wreck out the leader. NASCAR’s made it crystal clear that absolutely nothing will happen to you after the race.